I will add to this page as I get new questions where public answers provide a benefit to site readers. "Can the R record the dual pixel data like the DSLRs?" Yes, the CR2+DPR format is available on the R. This increases file size, but retains the depth information recorded by the dual pixel structure. "Is the sensor in the R the same as in the 5Dm4?" Canon says no without making any specific claim as to what is different. I suspect that there might be slight tweaks to timing and data offload. Canon does say there were changes to the microlens structure. "Are there really 5655 autofocus sensors on the R? Isn't that dramatically different than the competitors?" Yes, the R has a lot of individual selectable focus sensors. But it has even more actual focus sensors than 5655. The 5655 number is apparently the number of positions that can be actually chosen on the R in single point autofocus. The competitors also have a lot of sensors. The Sony A7's have well over 2000 focus sensors. My first problem is that a user can't possibly control a system and tell the camera which of the many thousands of sensors to use. In reality, you're likely to be just using one of the 384 focus zones on the R, not moving around until you find the right single point of 5655. The second is that any individual sensing position is pretty small, and isn't really reliable on its own to provide precise and quick focus on photographic subjects. In reality, all the focus systems tend to use multiple sensors together to make their decisions, and also place individual sensors into a smaller number groups for the user to select (those zones I mentioned earlier for the R). Canon has a unique dual-pixel design at the sensor, and a unique set of focus processing algorithms that use that data. I'd say those two things are much more important than the actual number of points used in focusing. Canon makes a point that's important to understand in this respect: "the amount of data used for processing autofocus [on the R] has increased to about 40 times the maximum of the EOS 5Dm4 in Live View." All of the mirrorless on-sensor phase detect systems are producing massive amounts of data to process. It's how you interpret and process that data that becomes the big differential in how the focus systems work. "Are any of the autofocus sensors cross type?" No, that's a feature pretty much only seen on DSLRs. All the full frame mirrorless cameras use line sensing, and along the long axis (so called "horizontal-orientation"). "-6EV autofocus is great, right? Better than anyone else?" We get into footnote hell here. That's with an f/1.2 lens, and only on the center AF point. It's unspecific as to whether focus aids are in play. 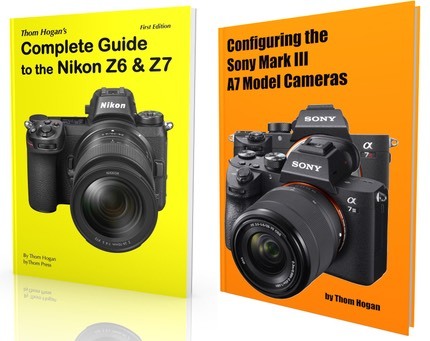 When you compare to the footnotes in the Nikon and Sony documentation, the Canon goes deeper into low light focus, but not by the multiple stops that the marketing messages seem to imply. The Z6, for instance, is no more than a stop different than the Canon with the same settings in play. "Does the R do a contrast detect step in single servo mode, like the Sony and Nikon cameras?" No. All autofocus is solely dual-pixel phase detect on the Canon EOS R.
"Is that something to be concerned about?" Only true long-term testing will tell us for sure, but probably not. It also means that all those EF lenses on the adapter are working exactly as they were designed for on a DSLR and shouldn't see any performance changes (true of the Nikon Z system, too). "Since the R only performs phase detect autofocus, does this mean we have to fine tune lenses?" Perhaps. While some of the alignment/tolerance issues of the DSLR are gone (sub-mirror, position of the autofocus sensors), when you use the EF to RF adapters they could reappear. Double that if you use a teleconverter on the adapter. The dirty little secret about adapters is no one actually makes them precisely to the implied mount differential. Why? Because metal expands/contracts with heat/cold, among other issues. No one wants to build an adapter that, under some conditions, might not allow infinity focus with a lens. But native RF lenses on the R should, if Canon's build tolerances are any good, not require focus tuning. It's only the adapted lenses I'd worry about. "Why doesn't the R have sensor-based IS?" Curiously, though, the camera does have motion detection sensors in it, apparently. And that information is used to inform the lens-based system what to do. Canon's quote: "Dual sensing IS captures slight fluctuation with the camera's CMOS sensor and assists the control of the [lens's] IS unit." Moreover, when shooting video, Canon couples an overscan of the shooting area and moves the crop at the sensor (e.g. electronic correction) in addition to what the lens is doing. The problem, of course, is that half of the initial RF lens lineup doesn't have IS. To me, that's much more problematic than whether or not the camera has sensor-based IS. I tend to prefer lens stabilization over sensor stabilization (I shoot with a lot of long telephoto lenses, where there's an advantage to having the rotation in the optics), but not having any stabilization puts the R at a slight disadvantage with some lenses, including two of the first RF lenses. "Is the shutter closing when you change lenses really a game changer for dust on the R versus the others?" In inclement weather or the presence of sneezing shooters, maybe. There's no perfect answer, unfortunately. You have to ask where does dust come from and how does it move within a camera to get to the sensor filter? Well, the shutter opening and closing produces an airflow. So does zooming some lenses. Neither of these things change with Canon's design, so dust is still going to move around and get to the sensor. Moreover, the most pernicious thing we deal with is actually lubricant from the shutter splattered on the sensor filter. Canon's design won't help with that. Also remember this now puts the shutter blades at risk if you touch them accidentally while the lens is off. That said, the benefit I see is changing lenses in inclement weather, or near sea spray/mist, and in high pollen season. "Is the RF mount just the EF mount with a shorter flange distance?" No. The RF mount redefines a lot of the communications between camera and lens. For instance, lenses now report to the camera all the necessary Digital Lens Optimization data. In other words, all RF lenses come with all the necessary lens correction data, you don't download that data to the camera when a new lens comes out (EF lenses still have data stored in camera; note you may have to download updates to the lens if Canon decides that they have better information after a lens ships). Second, the mount communications are faster and designed for future bandwidth increases in the cameras. The new mount has 12 connections between lens and camera, the old mount has eight. "Couldn't Canon have designed a 28-70mm f/2 lens for the EF mount?" Yes, they could have. Canon's claim is that such a lens would have been larger in an EF design due to mount constraints. "I've heard that the RF lenses have more vignetting than equivalent EF lenses. Is that true? Is this an issue?" Well, it still needs some empirical testing to verify—most sites are posting images that use the camera lens corrections turned on—but it appears to be true for the 24-105mm f/4, and especially for the 50mm f/1.2. The thing about vignetting corrections is this: you're pulling up captured data, so the dynamic range properties of the sensor start to become of interest. I can say this: I've got a couple of lenses with very high vignetting on my Sony A7Rm3, and when you shoot at higher ISO values and correct for vignetting, you risk pulling up noise in the corners. And that's on a sensor with excellent shadow capability (though at high ISO). The knock on Canon sensors is that they don't have the shadow boost abilities of the Sony sensors, which means that, yes, this could be an issue if the actual vignetting is in the two-stop or higher range. "How do you turn IS on and off?" Same as with the other EOS cameras: with the switch on the lens. While some bemoan the fact that the R doesn't have sensor-based IS, what I've found is that most mirrorless systems don't expose the IS activation to a control, which means you always have to drop into the menus to control it. And yes, you should control it. The notion of "IS always on" is an amateur one, not a high enthusiast or pro one. "Both Nikon and Canon picked new mounts with very short back flange distance and announced new mounts within weeks of one another, using very similar discussions about the optical benefits of doing so. Did they collude against Sony and others?" We have a special investigator looking into this, but his final report wasn't conclusive ;~). But the answer is no. Canon and Nikon both had some time to think about what others had done in mirrorless, and whether there were additional advantages they could bring to bear when they started fully competing. Both Canon and Nikon are companies with a long, long history of being optical wizards. These days, lenses are designed and modeled using computer software. Almost certainly, both company's optical engineers kept finding that there were limits to what they could do that were impacted by their previous mount decisions. To most of us, those limits didn't seem very restrictive or problematic—we've been getting better and faster lenses for some time now—but to the optical engineers, they saw how the mount position was clipping options. I believe both Canon and Nikon benefited by not racing to mirrorless for their top cameras (even though Nikon dabbled with the Nikon 1 and Canon with the EOS M). They eventually saw that mirrorless allowed them to break some optical constraints, so they did so. In Canon's case it was just making the flange distance shorter and changing mount communications. In Nikon's case it was making the throat as big as Canon's (actually 1mm more now), making a short flange distance, and changing mount communications. "What about the additional control rings?" Hmm. I heard there was a meeting at a tower building in Tokyo about that... But again, I think this was likely provoked by similar thinking given enough time to brew (both Canon and Nikon have programmable focus rings, and in some cases additional programmable rings on their mirrorless lenses). One problem with mirrorless is this: if you use the removal of all the DSLR components to make a smaller body, you also have less real estate to put controls, and the ergonomics can suffer. Indeed, what's been the common complaint about the Sony cameras since they appeared? Small buttons and controls, plus ergonomic issues. Both Canon and Nikon had time to think about and try to address that. But there are differences in the approaches the duopoly took to adding a ring. Canon is doing something that breaks their handling tradition. Nikon simply added something to theirs. In the Canon EOS world, it's been two vertically oriented dials for a very long time. One around the Direction pad operated by your right thumb, one at the top of the camera operated by your index finger. Two dials only give you control over two variables (typically shutter speed and aperture). Users have long been demanding more. Canon nixed the right thumb Direction pad dial and replaced it with the EOS M5's button/dial on the top plate. The index finger dial is still there. And now we have an extra ring on the lens (or adapter). My problem is that this is a change in ergonomics for an EOS user. We now have a horizontal and vertical dial on the top plate, a horizontal multifunction bar on the back, plus a ring that's either at the lens mount or out front on the lens. This feels rushed and wrong to me. Nikon, on the other hand, may have slightly changed the position and texture of the Rear Command dial, but we still have their traditional two horizontal dials controlled by the ring finger and thumb with the index finger still hovering over the shutter release. Nikon didn't really change the ergonomics of their DSLRs with the mirrorless camera. "Is the new multifunction bar useful?" Yes, it can be. Canon now really has four "variable" controls (dials, rings, bars) that can be active at one time. It's entirely possible to put shutter speed, aperture, ISO, and exposure compensation on those four, something users have been asking for a long time to be able to control simultaneously. My only problem is that we have four very different controls that are customized in different ways. There's a clear learning curve to getting the R configured the way you want to shoot with it. I do like that Canon has clearly made most button/controls immediately touch recognizable. The long line of buttons next to each other is gone. What I found is that I could identify all controls by feel only without taking my eye from the viewfinder, and that's a very, very good thing. "What does the A* Exposure Mode do?" As with most Canon cameras in their auto mode: automatically sets ISO, Picture Style, White Balance, autofocus method, and metering (can't be overridden by user). Also the camera sets various things like the lens optimizations and noise reduction. You're locked out of changing some other things, like aspect ratio, and all the exposure and flash options. "What the heck is Nano USM?" This is Canon's term for a very slim focus motor. The term has been around for awhile, but it's coming up again because some RF lenses make use of it. And apparently the RF Nano USM motors are even smaller than the EF ones. "The 1.74x crop for 4K is terrible." That's not a question. But it does pose a question: do you really know how your video image is being formed? There are three different ways that occur: exact pixels, overscan, and sampled. On a 30mp camera, 4K video would have to be sampled if it used the whole sensor. The bandwidth to pull all that data off a sensor that big results in a lot of cost, heat, and probably rolling shutter. Sampling has image quality implications, as you're doing a interpolation, not using real data. Cropping to get exact pixels (or a small overscan) tends to be the preferred choice to retain image quality and pixel integrity. Of course, that means your 24mm lens is no longer seeing an angle of view like a 24mm lens should. It's now something close to a 42mm lens in practice. So yeah, I understand the concern. You have to use really wide angle lenses to get any reasonable wide angle out of 4K on the R. Basically, you need a 14mm lens to get 24mm equivalent. Que bummer. "What Canon accessories work with the R?" The Speedlite flashes (270EX II, EL-100, 430EX III, 470EX, 600EX II, MR-14EX II, MT-26EX, ST-E3-RT, ST-E2). Basically all the EL/EX series Speedlites. The Power Adapters (AC-E6N with DR-E6, PD-E1). Also the BG-E22 Battery Grip. Other Accessories (GPS GP-E2, Microphone DM-E1, Remote Adapter Cable RA-E3 (with TC-80N3 remote) and RS-60E3. Wireless remote BR-E1.